Aqua Bags/Covers & Pillows There are 4 products. Enjoy a comfortable night on the bank, whatever the season, with our new Atexx Collection of sleep gear. Developed specifically for carp anglers, with a warm polar fleece on one side, soft cotton on the other. Fits into a dedicated pocket in the sleeping bag. Washable cover. The ultimate accessory for covert sessions, and the first offering from Aqua's new Tactical Range. This DPM bedchair cover is designed to help you blend in while remaining dry, as well as adding a further layer of warmth to your sleep system. 2000 x 850mm plus drape. 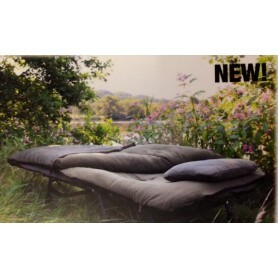 A cover for the bed chair that is covered in Aquatexx bivvy material meaning it is far more durable, breathable and waterproof than other covers that are on the market.